Every once in a while I need to create a video DVD that will work in a standard DVD player. With Windows 10, Microsoft no longer provides Windows DVD Maker, so I needed to find a replacement. DVD Flick does the job quickly and easily. It’s simple to add titles (individual videos), add regularly spaced chapters (so you can skip forward and back a few minutes at a time), and burn a DVD with a simple menu. This entry was posted in cool tools on October 16, 2015 by karl.kranich. I haven’t been able to find a way in Google Spreadsheets to insert a cell (or cells) in the middle of a spreadsheet and tell the existing content to shift down or to the right. Similarly, I’d like to be able to select cells to delete, and have them fill in by content shifting up or from the right. So, I created a Google Apps script to add “Insert Cells” and “Delete Cells” menus to Google Spreadsheets. Right now, you need to copy the code from github and paste it into the Script Editor in Google Spreadsheets (see the Tools menu). Hopefully I’ll get the code cleaned up enough to have Google approve it as an Add-on soon! Watch the video for a demonstration. This entry was posted in cool tools, Google Apps on May 2, 2014 by karl.kranich. Here’s the scenario: you have a second gmail account that gets email infrequently, but you need to monitor it. For whatever reason (company policy, in my case), you can’t forward the email to your main account. I discovered that I could log into the second Google account and attach a Google Apps Script to a spreadsheet. The script monitors the gmail account for unread threads. If it finds any, it sends a message to my main account. The script has a time-driven trigger that can be set to run as frequently or infrequently as desired. To use the script, make a copy of this spreadsheet. Open the spreadsheet and edit the cells that contain the email message parameters. Then go to Tools – Script editor. Choose Resources – Current project’s triggers. Add a time-driven trigger that runs the script as often as you’d like. This entry was posted in cool tools, Google Apps on March 21, 2014 by karl.kranich. Sometimes you want to find duplicate rows in a Google spreadsheet, but don’t want to examine every column — maybe you want to exclude a timestamp or other columns. This Google Apps Script takes a list of columns that you care about. Then it temporarily copies those columns to a new sheet, looks for duplicates, highlights the duplicate rows in red on the main sheet, and removes the temporary sheet. The script is attached to this Google Spreadsheet. Make a copy of this sheet, or just copy the script. You can do that by going to Tools – Script Editor and copying the script to the script editor of your own spreadsheet. Then edit the line that defines the important columns. After you re-open your spreadsheet, the “My Scripts” menu will show up. The first time you run the script, it will bring up the permissions dialog. You’ll need to run it again to make it work. This entry was posted in cool tools, Google Apps on February 10, 2014 by karl.kranich. When looking for a Mac version of WinDirStat (see this post), I completely forgot about GrandPerspective. 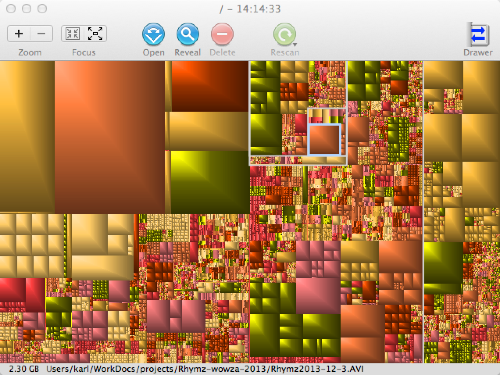 I love that it’s free and that it graphically shows what’s taking up space on my hard drive. This entry was posted in cool tools on December 17, 2013 by karl.kranich. 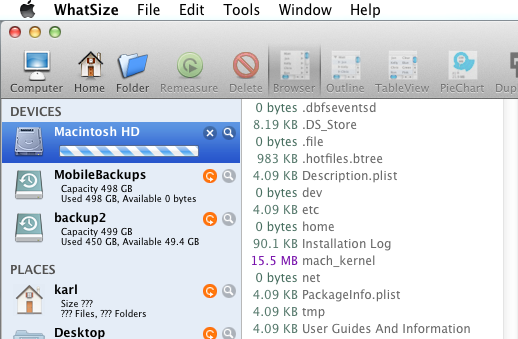 Where did all the space go on my Mac hard drive? Before I switched to a Mac, WinDirStat was my favorite tool for figuring out what was taking up space on my hard drive(s). There doesn’t seem to be a great free alternative on OS X, but it’s been totally worth it to spend $12.99 on WhatSizeMac (also available on the Mac App Store). When it’s done, you’ll be in a folder-browsing interface that lets you drill down and find the files and folders that are taking up the most space. This has helped me clear out a lot of unneeded files from my hard drive (video footage that I didn’t need anymore mostly). This entry was posted in cool tools, Mac on November 12, 2013 by karl.kranich. Awesome Drop is cool. You want to copy some files to your Android phone, but don’ t have a cable handy. Browse for the Awesome Drop app in the Android Market. Install it an run it. It tells you the URL and code to enter in Chrome on your computer (it uses some HTML 5 features that are probably only in Chrome right now). Drag your files onto the browser window, and they’re automagically transferred to your phone! This entry was posted in cool tools, tech, tips&tricks and tagged android, mobileapps on September 20, 2010 by karl.kranich. I didn’t realize until this week that you can’t use the Amazon S3 web console to transfer files larger than about 300 MB into S3. In fact, sometimes files less than 300 MB will fail to transfer. CloudBerry S3 Explorer is a free tool that lets you transfer files to and from S3, and it works for much larger files, too! This entry was posted in cool tools, tech, tips&tricks and tagged Amazon, S3 on September 17, 2010 by karl.kranich. 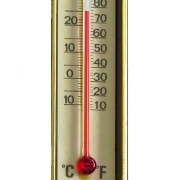 Check out my first post on ChurchIT: Monitor Your Data Closet Temperature for Under $75. And check out the rest of the 8BIT Network. This entry was posted in cool tools, gadgets, tech, tips&tricks and tagged DIY, infrastructure, temperature on July 14, 2010 by karl.kranich.